It’s common to hear of vanity projects in the booze industry, including when someone with loads of cash simply decides to start a winery so they can see their name on a label. I don’t criticize these people, mainly because they are creating jobs and (in most cases) helping the industry. Besides, I’d have a winery, distillery, brewery and restaurant too, if I had unlimited money to burn (it’s not an easy business in which to make a profit). Some vanity projects are owned or partially owned by celebrities, such as Wayne Gretzky winery, Francis Ford Coppola winery, and Dan Akroyd (who is behind Crystal Head Vodka), and there are also brands of beverage alcohol associated with celebrities, as opposed to being made in a facility owned by them, like the Trailer Park Boys beer I wrote about a few months ago. There are at least three hard rock bands I know that have dipped their mics and guitar picks into booze projects, including Maynard James Keenan from Tool, who started his own winery in Arizona, AC/DC branded beer, and the latest one I’ve tried: Trooper “Premium British Beer” from my favourite Heavy Metal band, England’s Iron Maiden. st Bruce Dickinson’s love of real ale (fresh, unpasteurized draft ale). Trooper, a 4.7% British Golden Ale, is brewed by Robinsons in Stockport, Greater Manchester, and was launched in 2013. They also brew another Trooper brand: a lighter ale called Light Brigade, and there have been one-offs, including 666, Red ‘N Black, and Hallowed. 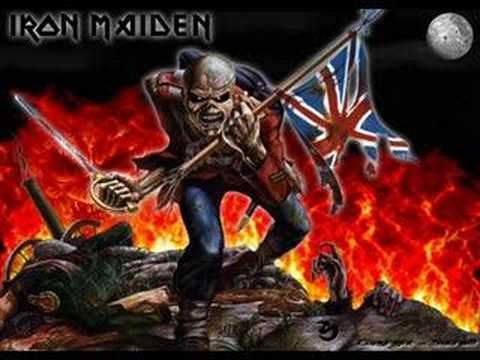 The Trooper is a famous Iron Maiden song, inspired by The Charge of the Light Brigade, an iconic part of the Battle of Balaclava (1854) in the Crimean War. Based on a mistaken order, 600 British cavalry courageously charged the massed Russian artillery, and many British died. Alfred, Lord Tennyson wrote the classic narrative poem “The Charge of the Light Brigade” soon after the event. The real question, though, is: “Is it any good?” As a lover of good British ale, I’d much rather try this beer in its cask conditioned version, which you can do in several Manchester area pubs. When youcan a beer for distribution worldwide, it is not the same. That said, it’s a decent ale, quite typical of a canned version of a British bitter: mildly hopped, quite malty, and with moderate alcohol. It’s better if you let it warm up a bit before drinking, and, if you put The Trooper on while drinking it, it really rocks.